The calm before the storm - A little sunday morning lavender picking. I feel like we are in the midst of the calm before the storm. I'm trying hard to savour every moment, dividing myself, my love, time and attention just 3 ways, enjoying the last few days/weeks of this, my very last pregnancy, those tiny movements and baby hiccups. I'm even managing to get a few full night's sleep. But at the same time i'm wishing the days away, excited to meet our new baby. I cant wait to see the kids' expressions as their new brother or sister enters the world. To inhale that delicious new born smell, nuzzel that silk thread-like hair, those early days... when baby is drunk on breast milk. Lying skin to skin together in bed, looking into those brand new deep blue eyes. Not that life with 3 little people is ever calm (and life has not been without its stress of late) but i just know that the moment labour starts, the frantic hour that follows trying to make it to the birthing centre in time, the labour and birth and then the intense few weeks that will follow, establishing breastfeeding, adjusting to the sleeplessness and being a family of 6, will be challenging. The storm is looming. So waking on sunday morning, the kiddies actually sleeping in till 7am ( a rare but blissful pleasure), as the morning sun crept in, we hatched our lavander picking plan. I feel so blessed to be living here in Portland, a city flanked on the west by the rugged Oregon coastline, and by Mt hood and deep forests on the eastside. Not to mention all the beautiful rural countryside, Wilamette Valley, rolling fields and the Columbia River Gorge in between. 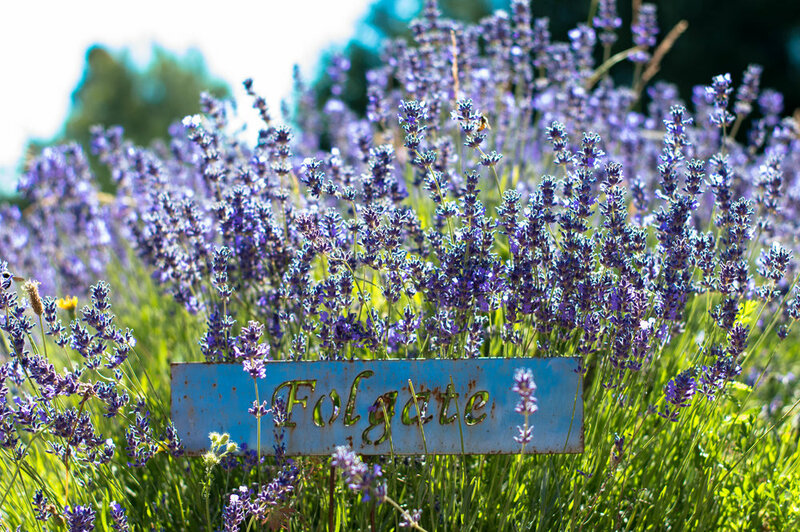 Just 30 minutes away, the intense scent of the lavender fields greeted us. The purple haze with a deep blue sky backdrop, white barns, enormous walnut trees providing welcome shade. 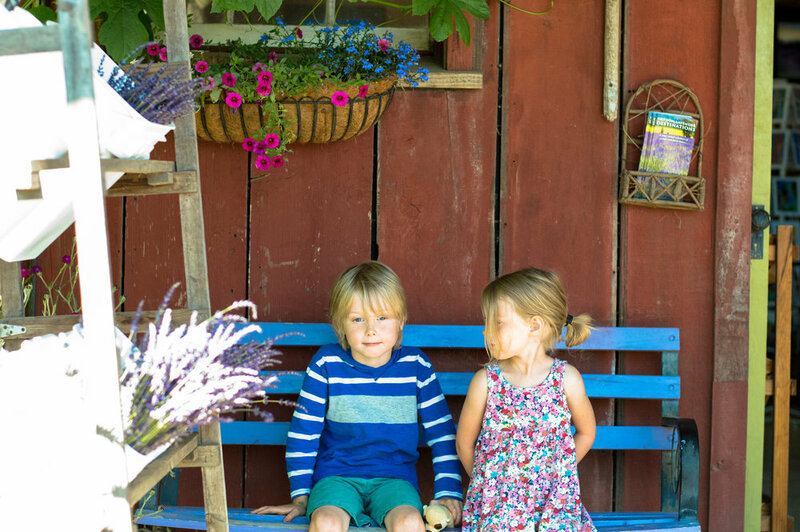 Our wicker basket ready to receive bouquets of freshly picked lavender, cut with avid excitement by our little people. 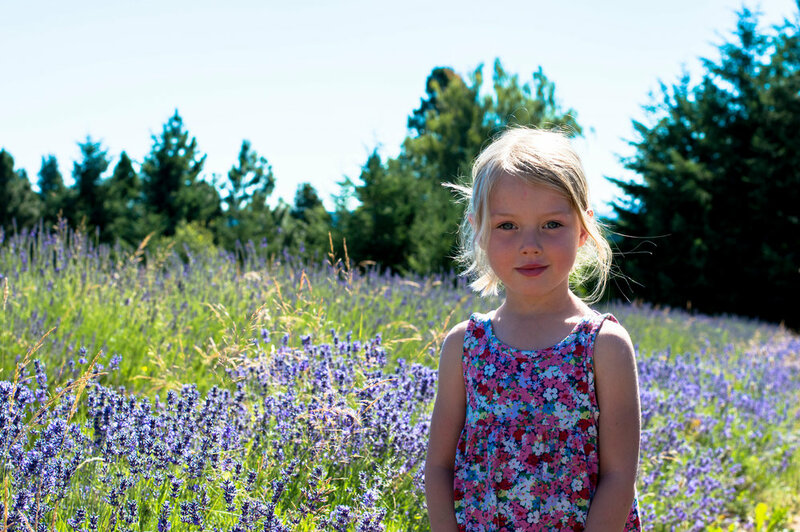 We walked the paths between the lavender plants, alive with activity of pollinating bees. We sat under a shady tree drinking lavender lemonade watching the farm chickens enjoy their morning dust baths. Happy times with my favorite people, possibly our last adventure as a family of 5. Not long now little one, and you will be accompanying us on such adventures as we explore and enjoy this beautiful world. How did you feel in the last few weeks of your pregnancies, would love to hear about it. Bathing with babies, pepermint tea and bucketfulls of blackberries : A few reflections on our first 2 months in our new rural home. Her days are busy and full. She is a dreamer, and idealist, a woman with big plans to save the world. She cooks, plays, takes pleasure in watering the vegetables, hanging cloth diapers out in the morning sunshine. She writes, she takes pictures, she encourages her little people to roam in the beautiful outdoors. Her life is ordinary but her heart is full.